The latest version of the Draft Professional Standards (V3) was shared at the National Conference. There was a large amount of support at the conference for the current proposals and a number of valuable discussions on the potential challenges and role of the standards. At present, IOL is looking at clarifying terms, and options for the next stages of development and consultation. If you haven’t done so already, please take a moment to look at the proposals and let us know how you would word things differently or propose a different structure. To ADD, CHANGE OR REMOVE your name from a group please email Louise at IOL. Many of you will have noticed the employers leading the creation of new Outdoor Trailblazer Apprenticeships are testing their thinking to date on the Outdoor Learning Session Deliverer Apprenticeship Standard. I hope many of you will have the chance to look at the evolving standard and offer feedback to the employers. Once this first standard is set, the employer group will look at an Outdoor Learning Programme Deliverer Apprenticeship Standard, and possibly higher outdoor apprenticeships. I hope members will look at the evolving apprenticeship standards and consider their relevance for future IOL Professional Standards. If we are to look at higher levels of recognition and accreditation from the Institute, it would be timely to consider the career pathways for members to get there. Asking ourselves what kind of Institute does the sector need in five or ten years time will also be essential to informing future plans. Is there a desire to have IOL accreditation or membership criteria that have a clear equivalence to QTS/QTLS, Chartered Member, Fellow or Senior Fellow in other professions? Is something else a better way for the Institute to fulfil it’s charitable aims and vision? Member discussions, consultations and comments have informed the developments so far and the following principles represent where there is a degree of common agreement. Please let the project know how you would word things differently or propose different principles for the working group to consider. NOTE: The above is in development. Please let us know how you would word things differently or propose a different structure. At present the proposals are being revised and all responses are being considered. Please get in touch or engage your local IOL Executive Committee with your aspirations. They could have a better fit with what employers/providers want when selecting, training and developing their staff. The criteria and process of the awards makes it difficult to accredit prior experience and learning (APEL) gained through the awards, FE or HE study. After 12 years the existing accreditation schemes are due for review to ensure they are fit for purpose as a professional institute. We are at the beginning of this process of change. In parallel to these IOL reflections, a group of employers in the sector have secured permission from the Department for Business, Innovation and Skills to create a set of new trailblazer apprenticeships. When successful, these will enable access to funding for training outdoor instructors and leaders that will replace and extend what is currently available. The new apprenticeship standards will be focussed on specific requirements for generic job roles. IOL as the professional body in the sector are working in partnership with the employer-led initiative. The institute will use the apprenticeship standards developed by employers to inform an update and revision of our own professional standards. A focus on end-point assessment will allow for multiple and varied routes to gaining competence and being assessed. Outdoor Instructor - Delivering outdoor learning sessions of up to a ½ day in duration to a predefined session plan, usually in rural locations within 30 minutes of help and the business venue. Outdoor Leader - Designing and providing a progressive sequence of outdoor learning sessions of up to 24 hours in duration following set business protocols and procedures and tailored to the participants needs, often 2-3 hours away from the business venue and help. Accredited Outdoor Leader - Interpreting customer needs to plan, resource, deliver and evaluate a progressive programme of outdoor learning of more than 3 days and often in remote and wilderness locations, potentially several days away from help. Certified Outdoor Leader - Developing creative solutions to educational and development needs using a range of locations, activities and expertise. Having the skill set to lead and develop other outdoor learning staff and the capacity to hold overall technical, financial, systems, staff or safety responsibility. At this early stage both the Institute and the employer group are embarking on a process of collaboration and consultation. It is essential that what each party develops will meet the needs of employers and can help assure the public they will receive safe, effective and high quality outdoor learning. Of course there will be many hurdles in the project to overcome – including working out the simplest way to transfer from RPIOL, APIOL or LPIOL to a new standard. I hope that many individual and organisational members will choose to assist the employer-led group to develop their apprenticeship standards or work with the Institute to shape and define our new professional standards. It is exciting times as we build on the successes of the current accreditation awards. Please do follow progress on the IOL website and get in touch with me directly to discuss your thoughts and comments. What are some of your drivers for changing the professional standards? They can help assure the public they will receive safe, effective and high quality outdoor learning. They fit with what employers/providers want when selecting, training and developing staff. They recognise prior experience and learning (APEL) gained through sector specific awards (e.g. NGB), academic study (FE, degree and postgraduate), vocational training (e.g. ILM) and other recognitions (e.g. QTS). Are the standards for field studies tutors or activity instructors? Both. We want to develop standards for generic roles in the outdoor sector that fit whatever the subject or activity specialism. Each role will require a different set of skills and will reflect a different level of responsibility. It will be similar to having a general professional standard for a chef, architect or nurse. What will the professional standards cover? Are the standards already set? No. The titles and levels already described are a starting point for discussion and definition. We expect many changes and refinements to ensure we have relevant standards across the whole sector. Is it worth signing up for RPIOL, APIOL or LPIOL if things are going to change? Yes. The new standards will not be live until late 2017 at the earliest and those who already hold RPIOL, APIOL or LPIOL will find it easier to get accredited with the new standards. Will my RPIOL, APIOL or LPIOL still be valid after the change? Yes. They will still be valid once the new professional standards are live. You will have the opportunity to transfer to one of the new standards if you wish. How will I transfer from RPIOL, APIOL or LPIOL to a new Professional Standard? Once the revised definitions and competences of each new standard are agreed we can look at the easiest way for people to move to holding a new award. That may be automatic, via telephone interview or via assessed short application. We expect many of the RPIOL and APIOL criteria will be relevant to the new standards - you will only be asked to evidence meeting those criteria that are NOT covered by your current RPIOL, APIOL or LPIOL..
Will you still need IOL Coaches? Yes, for new applications to the professional standards, the support of an IOL Coach is likely to be essential. Will the process of assessment change? It is very likely the style of the application form and assessment process will change. It will be essential that employers can have complete confidence that someone who has achieved a standard is competent in all the criteria that are assessed. 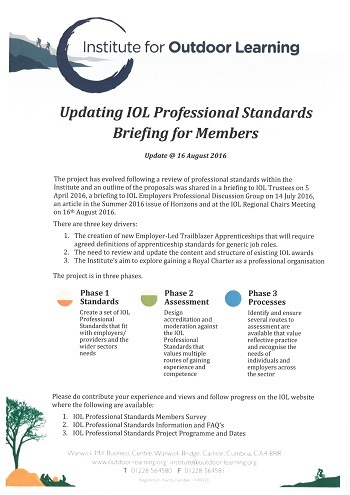 Are these changes part of IOL exploring being a Chartered Institute? Not in themselves, but we will ensure the changes are compatible with IOL being able to apply to become a Chartered Institute should it wish to do so in the future. What is the relationship between IOL and the Employer Led Apprenticeship? IOL as the professional body in the sector are working in partnership with the Employer Led initiative. The Employer Group has asked one part of IOL to take a project co-ordination role in helping that group consult and produce its standards, assessment thinking and governance thoughts for submission to BIS. The Institute will use the apprenticeship standards developed by employers to inform an update and revision of some of our professional standards. How can I get involved in the Employer Led Apprenticeship Development? How can I get involved in the IOL Professional Standards Development?